This end table is an excellent addition to your home. This piece features a round beveled glass top made with five times stronger tempered glass, so it will withstand heavy usage. Below, four tapered legs are finished in a nickle and oak finish. For a sleek and eye-catching complete look, add the matching cocktail table. 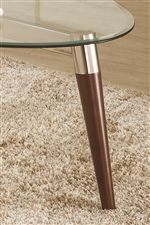 The 702900 Round End Table with Glass Top and Nickle and Oak-Finished Legs by Coaster at Del Sol Furniture in the Phoenix, Glendale, Tempe, Scottsdale, Avondale, Peoria, Goodyear, Litchfield, Arizona area. Product availability may vary. Contact us for the most current availability on this product. 702907B2 End Table Box 2 1 0" 0" 0"
702907B1 End Table Box 1 1 0" 0" 0"
Add this occasional table group to your living room for a touch of contemporary style. This group features rounded, beveled glass tops that are five times stronger than ordinary tempered glass. Meanwhile, the bases have tapered legs with a nickle and oak finish. Create a sleek yet inviting home with this collection. The 702900 collection is a great option if you are looking for Contemporary furniture in the Phoenix, Glendale, Tempe, Scottsdale, Avondale, Peoria, Goodyear, Litchfield, Arizona area.